A former member of the British Young Riders’ dressage scheme, Lara Edwards (Dyson) joined the senior ranks in 2009. Holder of seven British Dressage regional titles and two national titles, Lara secured her Team GB flag in 2015 after being selected to ride in Le Mans, France on her KWPN-approved stallion, Cyden Bodyguard Moorland. 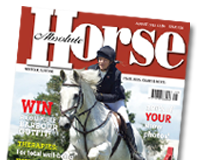 In our January edition dressage rider, Lara Edwards, discusses how to get the most from your schooling.